“Terrible journalism.” Let’s talk about it na. Osagie, in a podcast on Monday, proved just how unprincipled and senseless one can sound when they let their emotions overshadow common sense. 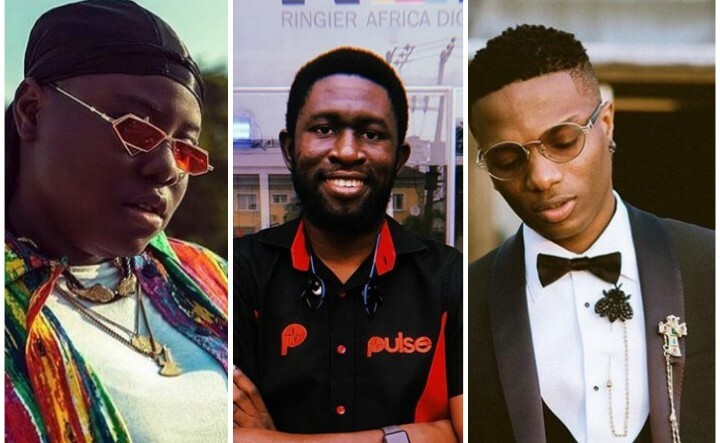 The pulse editor and his podcast crew were heard today slamming one of Nigeria’s favourite sons, Wizkid. Among a number of things, Osage accused Wizkid of being a drug addict, claiming that the singer’s heavy reliance on hard drugs is the reason for his fortune and misfortune. They continued to use vulgarities to make the most uneducated and uninformed argument in the history of mankind. The podcast was a complete mess and listening to it, a ridiculous waste of time. Their attempt to divert attention from the fact that they had nothing intelligent to talk about by screaming and breaking in strong languages was quite frankly desperate and a little sad. I honestly wish I could get back the time I wasted listening to these lower level intelligence folks spew what they believed to be an arresting perspective, which would provoke intelligible discussions on social media. Spoiler alert! It didn’t. Instead, many were outraged. Lest I am misunderstood, I do agree that Wizkid needs to own up to his responsibilities as a father and give his children the attention they need to grow up mentally healthy, but these guys managed to make Wizkid look like the victim. Yes, that’s right! If you are male, living on the gulf of Guinea in the south, you have a high chance of being diagnosed with sexual irresponsibility — a rare disease only found in the western part of Africa. Mans’ continued when they should have just stopped, accusing Nigerian men – and the ‘industry’of being sexually irresponsible. Osagie claimed he had so much dark information on Wizkid but had been holding back for our sake (thank you Osagie), because apparently if he spills the juice, everyone would get mad. They continued the mess, claiming that Wizkid has destroyed so many people’s lives and the superstar does not care about anyone at all, being just a selfish star boy. They even managed to rope 2baba into this, brilliantly construing that 2face was the pioneer of pregnancy out of wedlock. They suggested that somehow, 2face is responsible for the actions of two grown men, Wizkid and Ice Prince, claiming that because he has several baby mamas, Wizkid and Ice prince imitated the king. They revisited Wizkid’s matter, stating that Wizkid uses cocaine as a tool to get ahead in life. They gave us insights into the inner workings of Wizkid’s drug cartel. Apparently, Wizkid employs a method of luring artists to his hotel room, where he pumps them full of drugs and goes on to steal their songs. For instance, Wizkid alleged theft of ‘Babanla’ from Dami Krane. Going further, they gave us more exclusive deets, this time, on Wizkid’s wealth. Somehow these detectives managed to investigate the artist and come up with conclusions that Wizkid is broke. That’s right, you heard it on Loose Talk first. A man with a Nike deal, sold out concerts, including a previously sold out O2 Arena Concert earlier this year, appearances on GQ, Sony deal, collabos with big-name artists like Drake, a Mercedes Benz 2012, a BMW X6, a Porsche Panamera, a 13 million naira house in Surulere and another luxurious home in Lekki, amongst other properties, is broke. They claimed that Wizkid usually puts up a facade, flaunting borrowed properties, portraying a fake lifestyle which he cannot afford because of his drug-induced lifestyle. The ranting continued. More nonsense was said. We would need to write a book to describe just how painful it was to sit through this podcast. But las las, everyone will be fine. A piece of advice for Loose Talk podcast: next time you want to make accusations, at least back it up with evidence. This is common knowledge for anyone above six. And also make sure your career or whatever you believe you have can stand the heat. Many Nigerians took to social media to call out the “talk show genius”, bashing him for information he reckoned we should all be thankful for. With the heat too hot to handle, Osagie released a public apology, admitting that he got overly emotional while discussing Wizkid, on the basis of unverified information. In all, it has not been an easy week for the “Mutha******* Starboy,” (sorry Weeknd, I’m talking about the true starboy). Since I’m in a good mood, here are some wise quotes from the podcast. Enjoy!